Sci-fi is really hard. Ok, filmmaking in general is hard, and usually when making this point about individual genres, it is Comedy that the “well, actually…” crowd points to as being profoundly difficult. But I’ve always felt this way about sci-fi. You may have heard the line somewhere along your life’s path that “constraints inspire creativity”. It is wisdom I subscribe to, but that motto suggests challenges for sci-fi. There is a profound freedom to the genre, in its ability to throw off the limits of current reality. This is precisely the form’s allure, and yet that makes it easy for creators to go adrift. Filmmakers must impose their own artificial limits when working in sci-fi, and within short film, that usually means coloring within the lines of old concepts. Today’s film pick, Hyperlight, is no different. The backstory of the film, provided via the film’s website, imagines a relatively near future where mankind has only just solved the challenge of faster-than-light travel. When mysterious contact is made from a distant star system, humans take their first tentative steps to the stars—things, suffice to say, don’t go as planned. For a genre defined by its bold ideas, the recycling of familiar premises may seem boring. 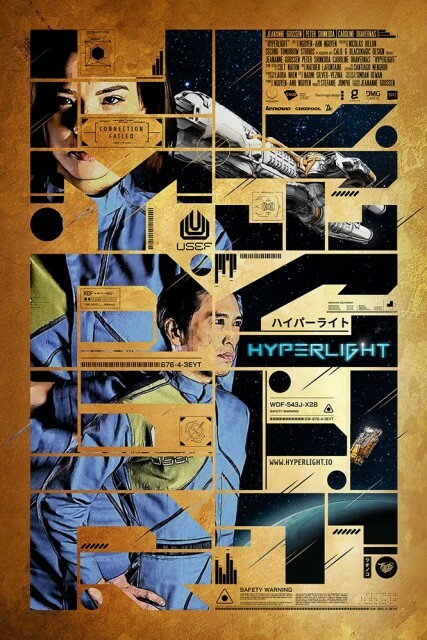 Yet what the tense, and supremely enjoyable Hyperlight proves is that there is plenty of meat on the bones of these old frameworks, and that storytellers in pursuit of novelty should first pay more attention to fundamentals. Most of the elements of the film are familiar from prior works—doppelgängers, survival-horror in space tension, the metaphysical mysteries of time-travel—yet director Nguyen-Anh Nguyen, working with a script from Nicolas Billion, takes this premise and treats it with a phenomenal level of care and detail to all the traditional aspects of filmmaking too-often overlooked in sci-fi proof of concept shorts—suffusing the plot with genuine emotion and earned investment. Hyperlight exploits stellar acting, great design, and careful adherence to the craft of filmmaking—the kind of craft that undergirds good work across all genres. What results is a cohesive whole that, despite not being unusually fantastical, accomplishes a degree of immersion that is rare for a sci-fi short. This is the point of world-building, to create a logically consistent setting that suspends audience disbelief. Filmmakers over-index on VFX, and yet skimp on other elements that potentially undermine this state. Visual Effects Supervisor Santiago Menghini‘s work is stellar, but Laura Nhem’s production design is its equal. Familiar actors Jeananne Goossen and Peter Shinkoda bring a degree of sensitivity that sells their connection. The film is marvelously paced—a big action sequence kicks things off to secure one’s initial attention, and the film has an intuitive feel for when things begin to lag. Thriller tropes kick in a quarter of the way through (mysterious life-forms on the computer screen, slow tracking shots down dark hallways) but the plot knows to pull the plug and move on before patience is tested. I found myself surprised to find that at the end of the 17min film I had not glanced at the progress bar once. Once you have that lock-in however, what do you do with it? For all the previous talk about ideas, Sci-Fi stories in the end are, like all others, human stories. And for sci-fi filmmakers confused by the form’s lack of constraints, it is important for them to remember that they are always there—in the form of love, fear, guilt, sacrifice—all the same themes that storytellers have been exploring for millenia. After world-building and action exercises with his previous work, The Akira Project (2014), and Temple (2016), Nguyen wanted to create an “actor’s film”, that focused more on human drama. Mission accomplished, Hyperlight is the Canadian’s best work to date. While modest for the form, Hyperlight employed the talents of of over 25 people on set in Montreal during its creation (check out the BTS for both Production and Post Production) and it’s clear that Nguyen is poised for a big new challenge. First up is a feature version of Temple, which is underway with the support of TeleFilm Canada and private investors. In the interim, Hyperlight will take to the festival circuit, so if you want to catch it on the big-screen, its festival premiere screening will be at Sci-Fi London Film Festival May 1st.